Don't miss live music most Fridays at the Pirate's Cove Bar! Full schedule of events available on the Calendar linked above. While Treasure Lake is a semi-private residential community, dining facilities, special events, event bookings, golf and camping are all open to the public. Just stop at the entrance gate, and tell them you are dining with us at the Lakeview Lodge. Treasure Lake offers several dining options within the community. From the fine dining experience of the Lakeview Lodge/Pirate’s Cove Bar, to casual dining at the 19th Hole Tavern, or outdoor dining at the Poolside Bar and Grill and New Providence Beach Snack Shack there is something for every person, couple or family. The Lakeview Lodge and Conference Center is home to fine dining with an unforgettable and vast view of Treasure Lake. Not just a fine-dining restaurant, it is a spacious, multi-faceted venue that is wonderfully versatile for lakefront weddings, wedding receptions, conferences, private events and group or corporate meetings. Located within the Lakeview complex is the Pirate’s Cove Bar where you can enjoy the same great food, live music, and also view sporting events broadcast on multiple screens. Duffers’ Tavern is temporarily closed for updates. The Lakeview Lodge will be open 7 days a week for both regular dining and special events. All other normally scheduled events at the lodge, such as Trivia Night, will continue. Please see the Lakeview Lodge section just above for the Lodge’s new hours. Pirate’s Cove Bar is located within Treasure Lake’s Lakeview Lodge. Pirate’s Cove Bar features Friday Night Live Music and the superb food created by Chef Scott from the Lakeview Lodge menu. A great place for a night out with friends. Open to the public and never a cover charge. For more information please call Pirate’s Cove Bar at 814-913-1430. 19th HOLE TAVERN is located at the Silver Course at Treasure Lake and is open 8:00 am to 8:00 pm Daily during Golf Season only. Great breakfast, lunch, and dinner choices available 7 days/week. For more information, please call the 19th Hole Tavern at (814) 913-1481. 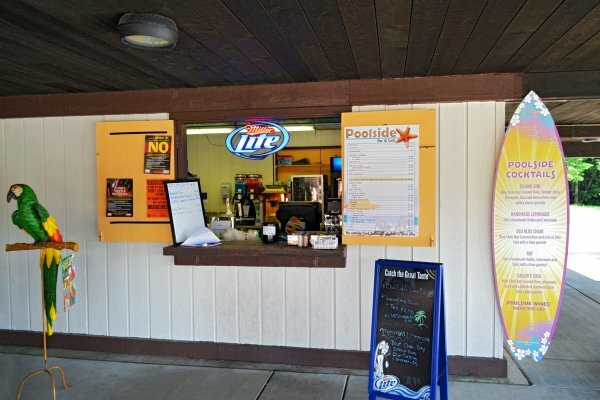 The Poolside Bar & Grill is conveniently located behind the beautiful Lakeview Lodge Pool. The bar & grill offers a fun, outdoor dining area for those who would like to enjoy lunch, dinner, a snack or just a cold beverage. Great entertainment planned during our open season. See our Calendar for Poolside Events, and all other things ‘Treasure Lake’! Poolside Bar & Grill is open daily from 11:00 am to 7:00 pm, Memorial Day through Labor Day (weather permitting). Chef Scott Patrick brings a wealth of culinary knowledge and experience to the dining amenities here at Treasure Lake. In addition to our wonderful menus which are rotated at least two times a year, Chef Scott presents a large number of special dining experiences to residents and visitors of Treasure Lake. You’ll enjoy wonderful buffets, finely prepared Friday Prime Rib or Spare Rib Specials, Surf and Turf, Holiday, seasonal, or theme-based culinary events. You will never lack for a wonderful dining experience here at Treasure Lake.